Kate Moss, Sarah Jessica Parker, Angelina Jolie, Bryan Boy, Jennifer Lopez, Sienna Miller—these are just a handful of the celebrities who currently rely on Loewe’s sophisticated pieces to carry them through their busy days. Pretty diverse—and impressive—wouldn’t you say? But the Spanish clothing and luxury goods brand (prounounced Lew-ay-vay) has humbler origins than the pretty arms of the regularly paparazzi’d. Founded in 1846, the company began when a circle of craftsmen joined forces to open a leather goods shop in the center of Madrid. However, it wasn’t until 1872, when the German manufacturer Enrique Roessberg Loewe hopped on board, that it was established as a full-blown brand. Growth, from that point on, was slow but steady, including the celebrated launch of the famous Amazona bag in 1945 and the house’s first women’s ready-to-wear line in the 1970s. Since then, everyone from Karl Lagerfeld to Giorgio Armani has designed pieces for the brand, and Narciso Rodriguez was installed as designer of womenswear in 1996, remaining in that position until 2001. Despite these big names and the impeccable craftsmanship of Loewe’s product, the brand has kept a relatively low profile, especially compared to competitors like Louis Vuitton or Gucci. It’s possible that their pared-back simplicity is to blame—their designs are much less likely to garner attention than the loud, unexpected collaborations often offered by other companies. 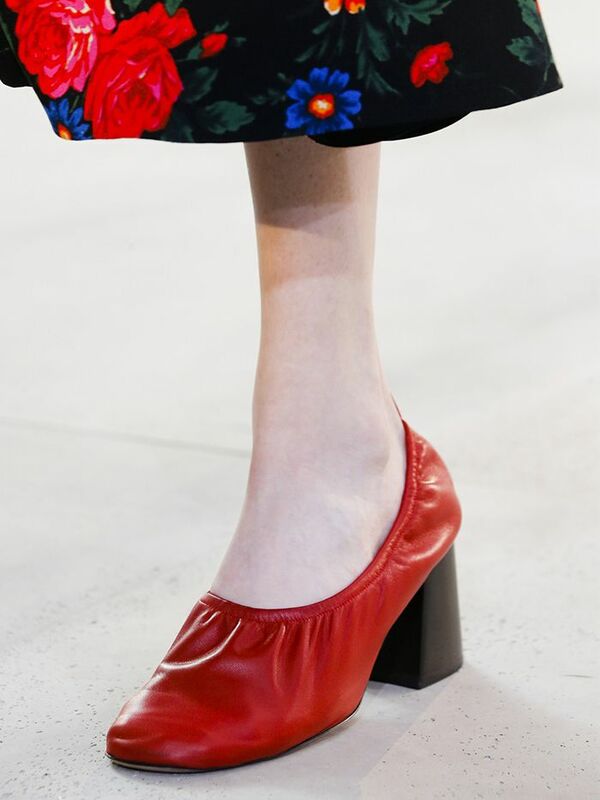 But fashion’s minimalistic leanings of late has meant that more attention is being given to brands who have perfected the art of “less is more,” an accolade that’s definitely worthy of Loewe. That said, it’s their newest creative director, Jonathan Anderson, who has ultimately guided our attention back to the brand. The designer, who also runs his namesake line, has expertly infused Loewe’s classic styles with a bit of that fun, unexpected quality so beloved in other houses. The union of timeless shapes (a doctor bag, say, or a suede trench) with Anderson’s specific whimsy (colorful, geometric shapes; super-sized details where you least expect them) has increased Loewe’s allure, with his standout pieces now commonplace amongst the captured-cool of street style imagery, or on the Instagram feeds of popular style bloggers. This successful recipe evokes exactly that which makes favored brands like Celine and Prada tick—quirk meets classic; "weirdness" in all the right places. Nowhere is Anderson’s vision for Loewe clearer than in the Puzzle Bag, a calf leather carryall comprised of numerous different pieces sewn together to create a very unusual—and original—shape. From one angle, it appears sharp, from the next, it’s edges round—but from all angles, it reads as elegant and cool, rather than one or the other. It’s a bag that would look equally at home on the arm of a grandmother or a twenty-something, carried by a female or a male. This lack of discrimination by design renders it truly modern, and provides a snapshot of what Anderson is doing with all of Loewe on a larger scale. Consider the leather trouser, by no means a novel idea, made special with a large judo belt and offered in unlikely shades such as saffron or bright yellow. Or perhaps his wool jumpers, heightened with a slit across the mid-section and a multi-color leather patch that’s sure to make anyone look twice. Not to mention his “peal off” tops, which render the wearer like a wall of peeling paint in a way that we never thought could be so appealing. The point is that his pieces are different, without sacrificing wearability. They’re clothes that make you think, rather than get in the way of your ability to do so. They’re expensive, as all luxury products are, but in this case they’re really art—Anderson isn’t just whipping things up to keep the shelves stocked, he’s innovating and taking the brand’s narrative in a direction that’s new but not jarring. If you love fashion like we do, you’d be smart to follow behind. Are you a fan of Jonathan Anderson's work for Loewe? Who are some other designers you're loving right now? Let us know in the comments!